For Makeover Monday, I wanted to take the data referenced in this article about Australia's wage gap and create a visualization that would quickly show the gap between wages for men and women in Australia. 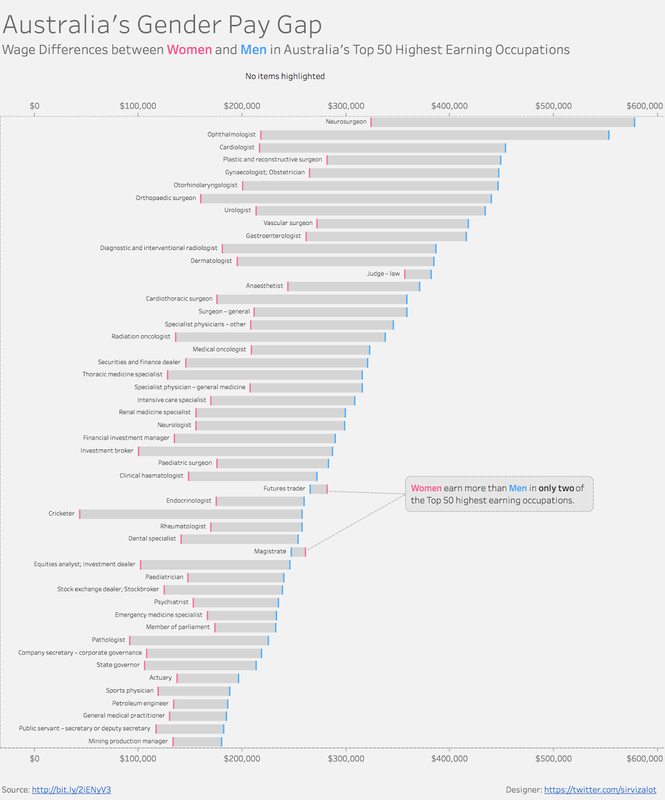 To begin with, I wanted to create a visual that would emphasize the gaps in pay by occupation. Previously, I've used DNA or barbell charts, but this time I wanted to try out using Gantt bars to show variance. When building the visualization, I did have some questions about using the mean instead of the median. Since we can't see the underlying data, one has to wonder if there are any outliers that would skew the data. Would it be more appropriate to use a median here, or is the mean okay? This issue has been raised before about visualizing data you didn't create or curate, so I thought I'd take a quick glance. If you look at the source data, it comes from Australian tax data, which is compiled from tax returns. This is taken from the entire population of Australia, so it is not a sample. Since it is an entire population, the average is generally acceptable to use, so that's why I went ahead and used it. Also, the Australian government does not report the median in their statistics either.